Every device needs to be locked to keep it from unauthorized access. There has been the use of patterns, passwords, pin numbers and a lot of other methods of authentication but the use of our voice even made things a lot easier. But just as the aforementioned methods of authentication, hackers can still temper with voice recognition and gain access to our device without permission. With voice-based authentication, all a user need to do is to store a spoken passphrase on the device. The device stores the spoken passphrase and the user’s voice-print securely on an encrypted – secure – database. But the device users should understand that hackers can record their voices, simulate it or try to imitate it, thus making voice-based authentication vulnerable. Some hackers do the hard work of finding someone who sounds like the device owner to speak to the device and unlock it. It is obvious that most hacks can easily be linked to someone very close to the device owner. For me, if I’m not at home, it does not matter how professional the place looks. Once there is an attacked, everyone becomes a suspect. Some hackers simply record your voice and then use a computer to generate any word they want with the same voice. Once this is done, they could easily hack into your device and gain access to personal information, classified office files, unpublished documents, bank details and other important data. According to an article on the conversation, a stand-alone application has been developed to protect users from voice authentication criminals. They have come up with several ways of detecting a hacker who is trying to break into your phone. The first way is based on the fact that if a hacker records your voice, he or she would have to use a speaker to play back the voice over the device to unlock it. The system detects and magnet in the speaker using sensors in your device and then refuses to grant access. But what if the hacker is using a loud speaker to send the sound waves from a distance so the device won’t detect the magnet in the speaker? This system almost has everything covered. The system requires the user must move the smartphone or device from side to side in a half circle in front of his face while speaking. With the combination of several data, this system can differentiate the activity of a criminal from that of the device owner. Nevertheless, no system is completely secure. Users must always do the good work to protect their devices from these criminals. 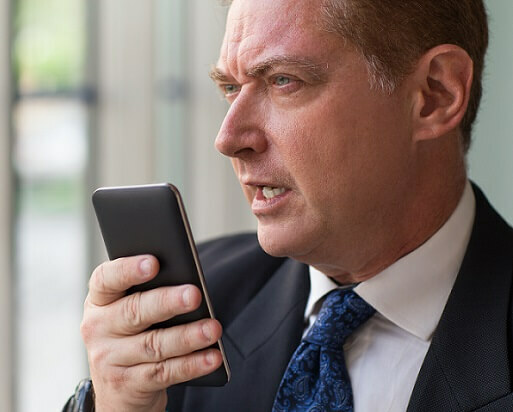 If you are using voice-based authentication applications and devices to store important information, you must be careful how you wine and dine when you are not alone.